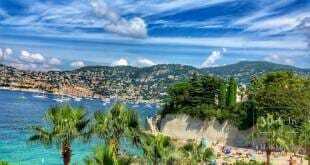 The French Riviera is commonly known as one of the most scenic places in the world. In addition to its incredible mountain lands capes and breathtaking Mediterranean views, it is also home to beautiful gardens. Many of these gardens hide a century-long history in the shade of their perennial trees and flower alleys. 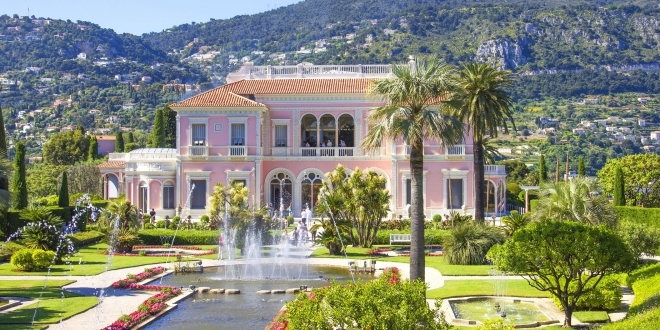 We have selected the top 5 most beautiful gardens to visit on the French Riviera. 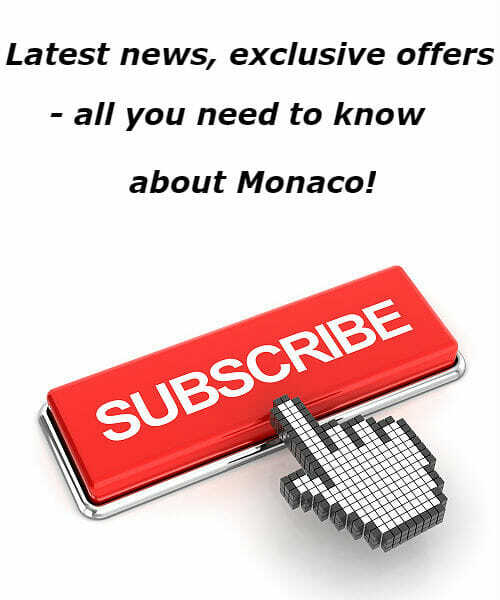 This gorgeous villa located on SaintJean-Cap-Ferrat is the first on our list. It has a selection of beautiful gardens and a singing fountain that entertains its visitors every 20 minutes with famous classical symphonies. This villa is truly special. It must be said that this is the only historical monument of the Cote d’Azur open for free visits. The history of the mansion is inextricably linked to the name of Beatrice de Rothschild (1864-1934), a representative of the famous European dynasty. From her young age, the lady was quite advanced for her time: she drove her own car (which was not considered a woman’s business at all) and was a member of an aero club. Despite her passion for «masculine» pursuits, she remained very feminine, with her love of flowers, art and pink. So it comes as no surprise that the Italian Renaissance style villa, built by Beatrice in 1912, is the perfect shade of rose pink. The construction of the villa was no simple feat. It took 7 years to complete the residence, as the Baroness dismissed more than 20 architects. The facade thus intertwines Lombard, Tuscan, Spanish and Venetian styles. The two-level landscaped grounds are divided into nine gardens: French, Provencal, Florentine, Sevres, Spanish, Japanese, an exotic stone sculpture and a rose garden, the favorite place of the Baroness. Beatrice was a fond collector and assembled a large selection of works of art in her mansion dating from the Middle Ages to the Renaissance. Childless, she bequeathed her villa to the Parisian Academy of Fine Arts in 1933. A year later, the estate passed on to the Institute of France that commissioned the artist Louis Marchand to restore the gardens after World War II. The villa then acquired its modern look and was named «Ile de France» in honor of the yacht that took Beatrice around the world. A blending of different architectural styles and landscapes was the result of her numerous travels. Beatrice de Rothschild wanted to bring together all the best of her discoveries during her fascinating trips around the world. 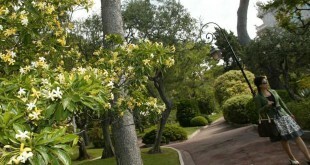 The next destination is the Val Rahmeh Estate in Menton. It was opened in 1922 by Lord Percy Radcliffe, the former mayor of Malta, naming the estate after his wife. Percy completed the main building and created a majestic palm alley at the entrance. He then decided to turn the estate into a garden of indescribable beauty with rare plants and exotic trees. But the botanical gardens weren’t perfected until the 1950s, by an Englishwoman named Miss Campbell. She transformed the garden into a magical place filled with floral scents and colors, significantly increasing the plantation area and the number of ornamental flowers. In 1966, ownership of Val-Rahmeh was transferred to the Ministry of National Education. It later became the property of the National Natural History Museum. Nowadays it is a botanical garden, open to the public. The 1.5 hectares host several collections: tropical and subtropical fruit, nightshade plants (dicots with many edible and cultivated species), palms, lilies and other species. All in all, the garden has about 700 varieties of fruit and medicinal plants and trees. Interestingly, the tropical and subtropical plants were brought from all around of the world: Greece, Africa, the Canary Islands, China, Mexico, New Zealand, and more. Some of the trees are very sensitive to cold, but the Riviera climate, between the mountains and the sea, allowed them to thrive. 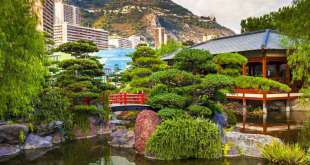 The garden on Avenue Princess Grace in Monaco is a miniature copy of a real Japanese garden with waterfalls, beaches and streams. This authentic masterpiece was made in a strict accordance with a «Zen» concept. It presents a genuine harmony between the land, water, and vegetation. 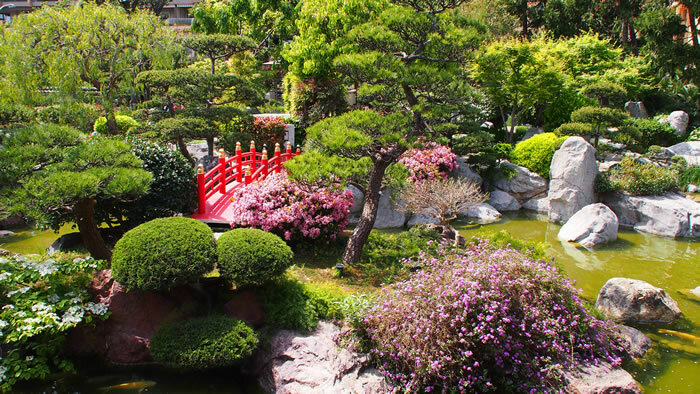 The Japanese garden was designed on the initiative of Prince Rainier III in memory of Princess Grace. 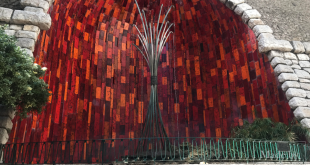 The landscape architect, Yasuo Beppu, took more than 17 months to finish it. The wood that was used to construct the tea house, the main entrance gate and the closed terrace was brought from Japan. The plants growing in the garden were exported from Italy, Spain, Germany, Belgium and France. The Japanese vegetation, less adapted to the climate of the Principality, is particularly interesting to see. The garden has a territory of 7000 m². 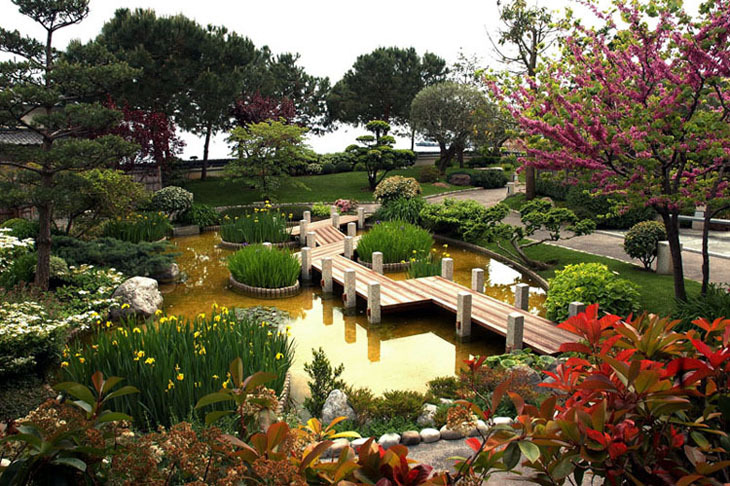 In November 1992, the Monaco Japanese Garden was consecrated by a Shinto priest from the Dadzayfu temple in Japan. 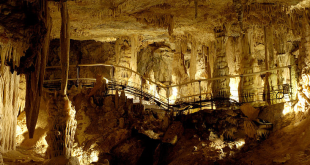 On 7 May, 1994 it was solemnly opened to public. Riviera at the time was afavorite with high society, in particular, Russian and English guests. capricious, between arid summers and torrential autumn rains. 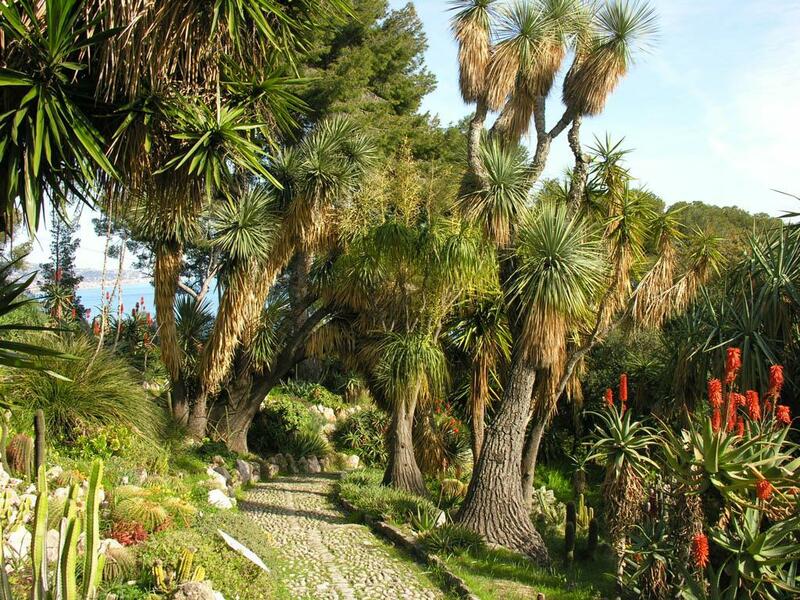 Gustave Thuret involved a large number of scientists in order to present new vegetation varieties on the Mediterranean and transform the landscape of the French Riviera. After the death of Gustave, Edward Borne continued his scientific work. In 1877, the wife of Gustave’s elder brother bought out the park and gave it to France on condition that the botanical research initiated by Thuret would be continued. In 1927, the villa became the property of the Ministry of Agriculture property of the Ministry of Agriculture and was transformed into the Center for Agricultural Research in Provence. Here you can see eucalyptus, cypress, rare tropical plants and immense rose gardens. Today, the botanical garden counts 1600 species brought from Africa, North America, New Zealand, China, Japan, and Australia. Each year, up to 100 new species are planted here. This kaleidoscope of vegetation is really worth seeing! Our journey across the most beautiful Riviera gardens makes a final stop in the picturesque town of Ventimiglia. This is where Italy’s largest garden is located, and also one of the largest in Europe. Its territory covers about 18 hectares. 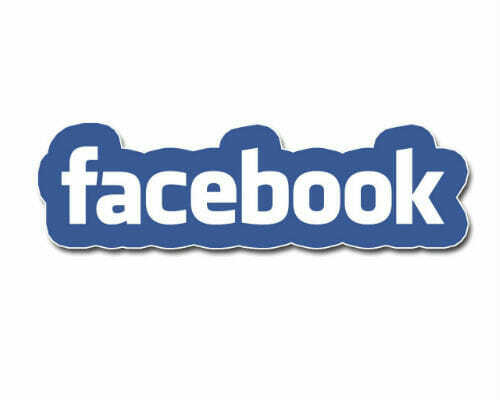 It was founded in 1867 by an Englishman, Thomas Hanbury, who made his fortune by trading in tea, spices and silk. This huge area of scattered olive and citrus trees, flower plantations and almond trees took Hanbury’s breath away. 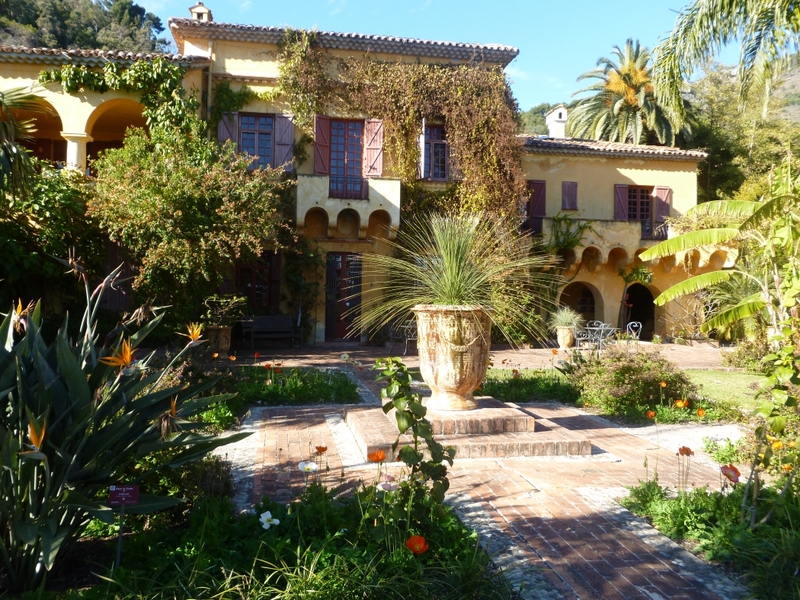 He built a villa on its territory in Moorish style, remotely resembling the Alfred Nobel estate in San Remo. After his death, the residence went to his son, but was completely destroyed during the First World War. In 1918, Hanbury’s daughter-in-law, Dorothy Simons, spent a fortune on its renovation and partially opened the gardens for public visits. After the Second World War, Lady Dorothy could no longer bear the expense of its further reconstruction, and the Hanbury Garden was sold to the Italian government. The garden was then managed by the International Institute of Liguria, and later on, by the University of Genoa. 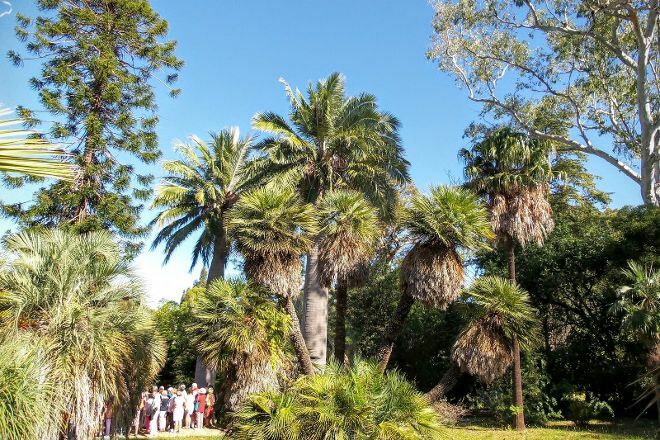 In 1987, the botanical garden underwent a large-scale restoration and became a nature reserve in the 2000s. 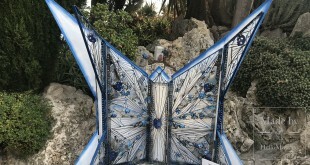 Today it is part of the Grandi Giardini Italiani.